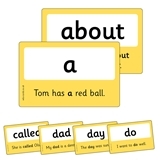 These quality high frequency word flashcards are perfect for sight recognition activities to help pupils to learn their essential key words either in School or at home with parents. They come in a durable plastic box so they will stay in good condition. 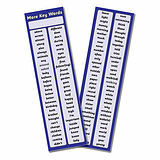 Many parents are willing to buy these for their child to help them as they learn to read and spell. These cards have been produced on thick 650 micron cardboard and laminated on both sides so that they should last for many years.